Following a reflection upon Simon Stone’s production of Yerma, the chapter challenges both Zeki and Pavis’s visual and design categorisations. 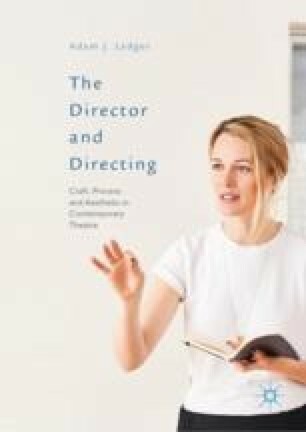 It argues that scenography is a fundamental directorial Gestus and proposes a new taxonomy for discussion. How the brain processes sight features; the vertical illuminates a discussion of Krzysztof Warlikowski’s Phaedra(s). The ‘real’ spaces of Jan Versweyveld and van Hove align with the immersive, and the representational scenography of Cracknell and Tom Scutt’s The Deep Blue Sea contrasts with a set of van Hove’s productions, to suggest a simultaneity of the actual and metaphorical. Neuroaesthetics illuminates the kinaesthetic body and objects, exemplified through Donnellan’s Russian productions and Lepage’s totality of theatre-making. An examination of Wilson’s Krapp’s Last Tape argues for expressionistic sound, and the original notion of vernacular design illuminates Dmitry Krymov’s work. The chapter thus finds that design is an always active performance of directorial knowledge.